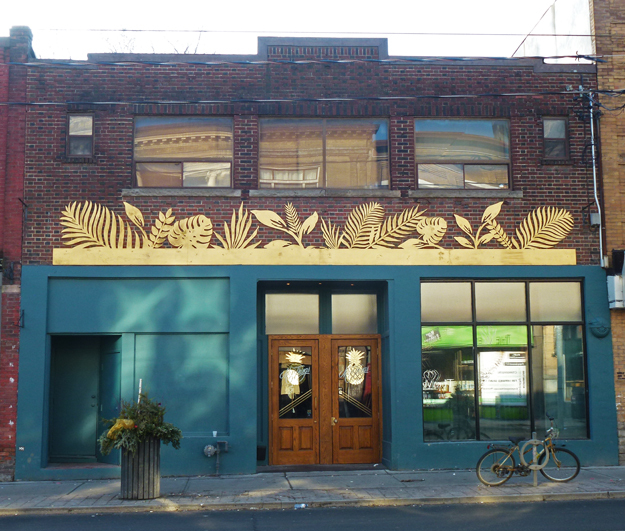 It was the cut-out leaves that attracted my attention to this building on Queen St West in the Parkdale neighbourhhod so then I had to investigate. It turns out that it is called Miss Things and it is a restaurant and bar serving classic Pan-Asian and Hawaiian food with a contemporary twist. It was closed but I checked on-line and the interior has a great retro look. I think a visit is needed! Hawaiian, eh?! Go in and ask "HOWZIT?" Looks interesting. I always enjoy finding a new place to eat! Oh yes, please let us know how it is when you go. I love the look of the place. Very attractive looking place, definitely worth a trip to see how their service and food is. Most creative decoration on this building makes for a great photo. Love the light in your picture. Absolutely a visit! Hope it's delicious too. Very attractive & a great way to draw in customers! ...a common style building here! Very nice and unusual decoration. I like it. Nice decoration The facade draws attention, Pat. Yes, you need to return and photograph the interior to show us! Pineapple motifs on the door are a welcoming image! Ooooh sounds interesting, I'd eat there! You must have been riding your bike past this place, right? I'm glad no one trashed your photo! Cute. I definitely agree on the need to check out the interior and the food. How pretty that decoration is...and what a great neighborhood. You really do need to check out the restaurant, so that we can all visit it vicariously. I just know it is going to be as great inside as out! I keep hearing about Miss Things will have to check it out too! Wonderful! Such a simple embellishment.